So,how do you like my sets? I got almost all the Rifts from my old GM,as he was being Deployed(he was in JROTC) and couldn't take them with him. Last edited by MacynSnow on Sun May 27, 2018 2:21 am, edited 1 time in total. -City Rats are an urban form of the "Vagabond", but more streetwise and with a criminal bent. I actually really like this class- they're more meant to reflect what the "common residents" of dark, disturbing cities are like, but it's a great bit of "Flavor" text, even if the imagery is all "late 1980s". The Rulebook even indicates they can be rebels, adventurers, idealists, hackers, thieves, beggars or common street thugs- they're scrappy, tricky and stealthy. Except they also have MEGA-DAMAGE BODY ARMOR, making them very dangerous combatants as well. I dig it. -My "Idealized Rifts Party" actually contains a City Rat, largely as the "Kitty Pryde" (ie. "Normal Person in a crazy world") character, contrasting what is sure to be a wild band: a Dragon, 2 Juicers as "Bash Brothers", a Cyber-Knight, and probably a Coalition "Captain America" type that's starting to see the light. 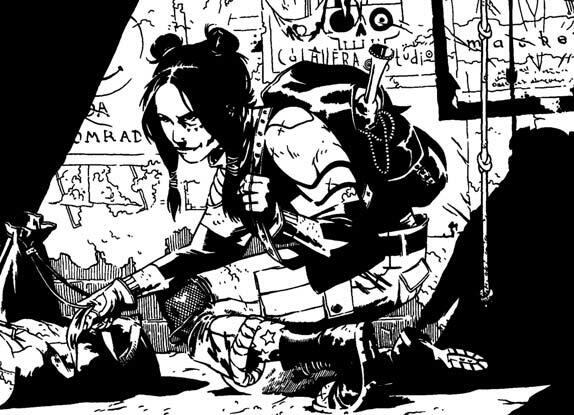 While it's probably not the best thing to use in an actual party of PCs, characters like that are especially necessary in a supremely F'd up world like this one. -City Rats have few Class Skills, but a REALLY wide variety of secondary and "related" skills- as many as the Rogue Scientist! This makes them more "variable" than other O.C.C.s. The stats also let them be as good a fighter or as tough as a Coalition Grunt! I actually had to scale them back a bit, as I was aiming more for a "stealthy underground fighter" type than "Super-Heavyweight", tricky as that is with an overpowered game world like that of Rifts. So I'm figuring I'll throw most of the Coalition's stuff into my "Official" Rifts Thread in "Character Sheets", but I might throw some stuff in here as practice. This can be more scattered, but I'd like the official thread to be pretty organized, in a way. Last edited by Jabroniville on Sun May 27, 2018 9:57 am, edited 1 time in total. I'd use Communication and Comprehend Machines for Telemechanics, but that's just me. OHHHHH, missed that part. It was the very end of a long stretch of statting out the powers and I skipped too much . -A somewhat large part of the setting is the "Xiticix" (Zy-tick-icks... which I've terminally mispronounced as "Zih-ti-kicks" my whole life) race of insectoid aliens. Mega-Damage creatures, they're said to inhabit massive hives all over Canada, and encroaching further. This seems to have a major purpose on Rifts Earth- the reason why the atlas isn't expanding past a certain point. Essentially, they're "filler" or "Here Be Dragons" material to explain why they haven't written anything about certain other areas. It's actually rather convenient and brilliant, because they weren't gonna get to Western Canada for a long time. AND it justifies why these human civilizations in the world haven't expanded their empires any further than they have. -The Xiticix even feature in their own "World Book", indicating a much more varied, dangerous threat, though I haven't heard much of that book, myself. -Xiticix are very powerful for a "Horde Race", making PL 7 with their durability and ranged weaponry. They're less durable than the Coalition troopers, but have a lot more attacks per round (giving them more accuracy in my stats). And they almost NEVER attack solo. Heh- I have no idea how I want to go, as far as "order of builds" goes on this thread. I'm ahead of my "Character Sheets" page, but also behind it, since I'm posting so much CS stuff in a row. I want to outline them, then the other Main Rulebook classes, on that thread. But also do all the Juicers at once. I suppose I'll use this one for planning and "does this look okay?" stuff. I've got some Wizards to post soon. Enemy (The Coalition)- The CS actively hate Magic, and will kill any sorcerers they can find. Power Loss (Magic)- Magic requires the internal energies the Sorcerer to work- too many Spells will wear them out. -The Mystic is said to be an intuitive, unlearned Sorcerer- one whose spells just COME to them, without any training or learning required. Sort of like D&D's Sorcerer class, but also with a smattering of Psionics. They know only low-level spells at first (the first two levels don't have any damage-dealing properties), but will slowly improve with time, gaining 20+ Spells by the time they reach their maximum. Their base spells are said to reflect the Wizard at that point in their life- greedy sorts will get spells to help thievery, angry men will gain offensive spells, etc. Their Psionics appear to never improve. Mages in Rifts were notoriously underpowered at first, lacking durability, Force Fields or even much in the way of combat spells. Despite their versatility, a City Rat or Rogue Scholar could still take them out. -Mystics gain six spells at Level 1, and never change. Every level therafter, they gain additional ones, gaining four, then three, then two for every level after the third, corresponding to their own level (so they have to reach their maximum before getting Level 15 Spells). 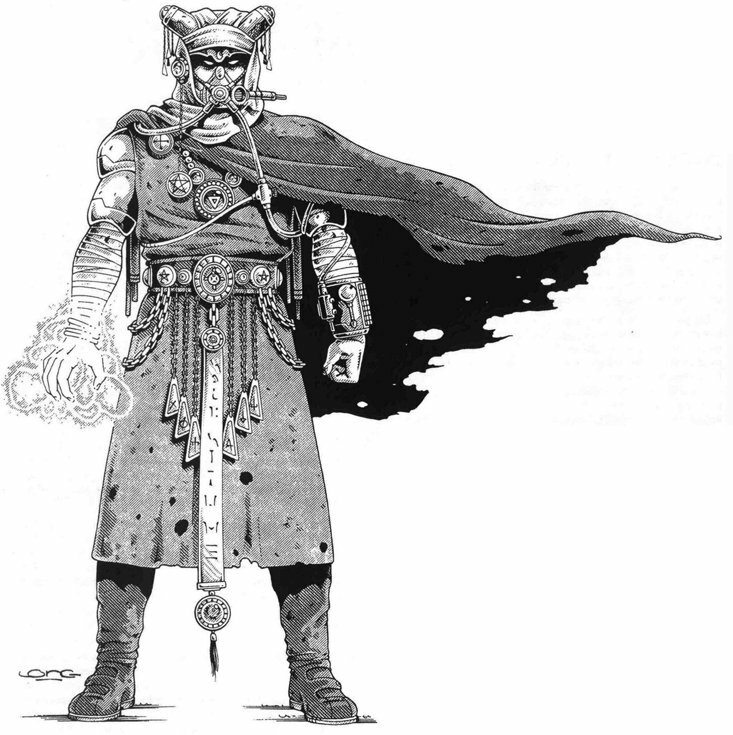 Their great versatily comes at the cost of Skills, which are VERY minimal, and their armor and weaponry are quite low. But how many D&D Wizards can tank a Rail Gun with their armor? -My Mystic here chose spells based around "Helping Others"- therefore, he has a lot of disabling Afflictions to target the enemy, as well concealing smoke, Detection spells and other things. 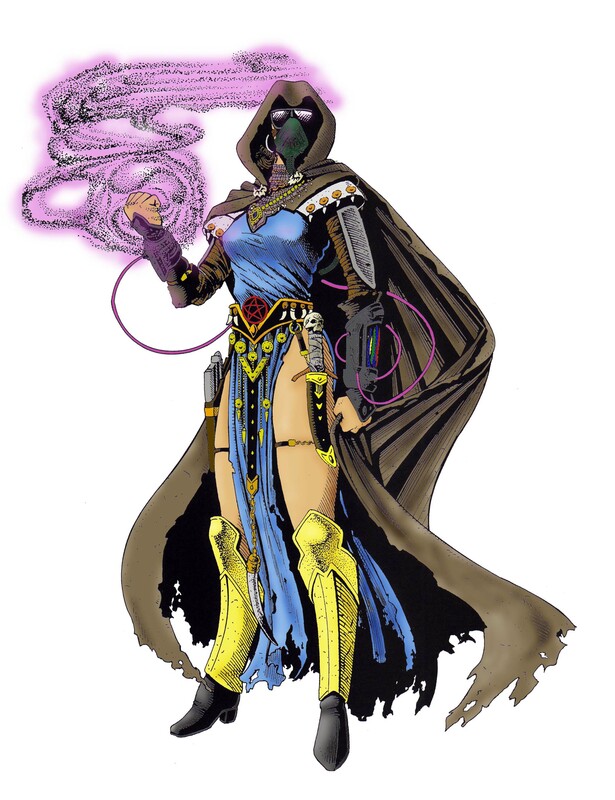 -Our "Generic" Spellcaster class, the Line Walker is named for the Ley Lines that encircle Rifts Earth. The Walkers seek them out, can feel and "touch" them, and spend years perfecting their knowledge of magic. For some reason, they're almost always depicted with these cool, futuristic "Gas Mask" things on their faces, though I can't find an explanation for them in the books. But it really makes them a stand-out class beyond "Guy In Robes", which would look hopelessly plain in this world. 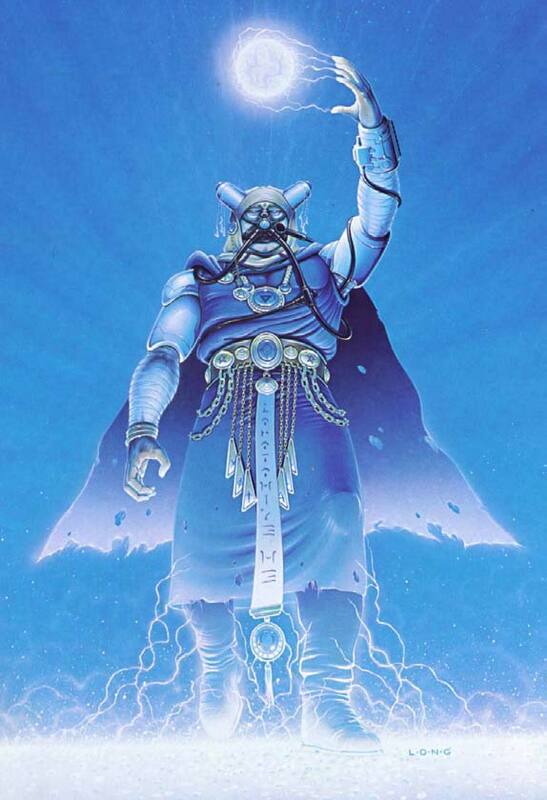 Line Walkers are mystically attuned to the Ley Lines which surround Rifts Earth, and has a lot of powers that revolve around just those things (I would guess that GMs are expected to use those a lot, particularly if one of these guys is in the party). -Like the Mystic, their damage-dealing power isn't the greatest at first. However, they are allowed to gain spells as a CLASS FEATURE, simply going around and learning them from willing teachers. The Line Walker can hit PL 8 with his Afflictions, and even ramp up his durability to PL 9 with either the Armor of Ithan or a Force Field in this model. Otherwise, they're relegated to "support" like a lot of the Non-Combat Classes. Still, the sheer versatility of these guys is not to be underestimated- with TWELVE baseline spells (three each from Levels 1-4), plus some Ley Line abilities, these guys are spending a ton of points on powers, and any of them could greatly boost your squad's tactical capabilities. Ley Line Walkers are also invaluable for their mass teleportation abilities, especially if you get swept up in a plot that will see the group crossing the continent — such as the A.R.C.H.I.E. campaign, the Four Horsemen campaign or doing a “world tour” that is going to take you everywhere. Sure, Glitter Boys can run 60 MPH and Dragon Hatchlings can fly, but they can’t do it forever. There’s APC tanks, flying APC tanks, and even walking robotic RVs... But those have their own problems. Doesn't it have to be along a Ley Line? Or does the GM just always determine that it was ? It has to be along a Ley Line, but those things are almost everywhere. You might have to hike the last couple dozen miles, sure, but it’s easier to travel 36 km than 3,600 km. For some reason, they're almost always depicted with these cool, futuristic "Gas Mask" things on their faces, though I can't find an explanation for them in the books. But it really makes them a stand-out class beyond "Guy In Robes", which would look hopelessly plain in this world. My reasoning was that Ley Line Walkers hang out near ley lines. And ley lines can open portals to alien realms, and those realms might have non-oxygen based environments. So Ley Line Walkers wear those masks in case they encounter a nexus expelling toxic gases. Likewise, since they have several spells that can conjure gas and mists, the mask protects them from the effects of their own spells. They also can’t wear environmentally-sealed armor, which literally everyone else is going to have at a minimum.